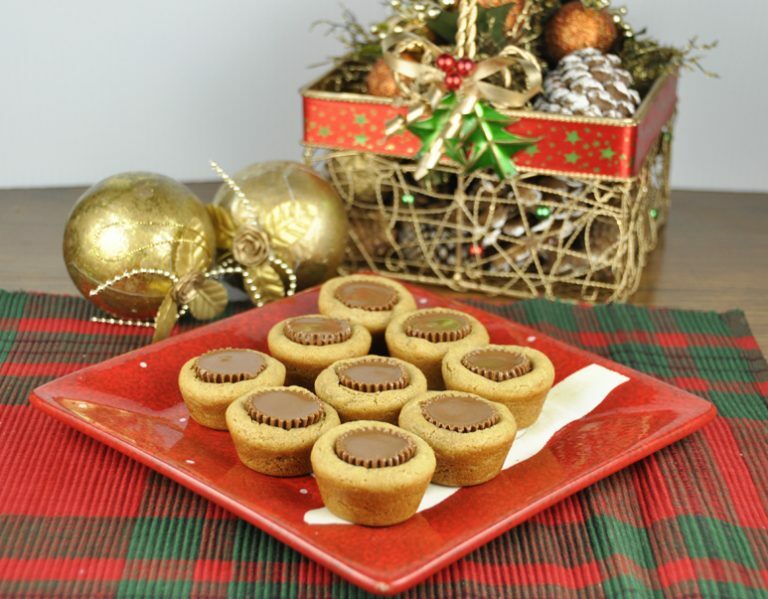 Traditional Peanut Butter Cup Cookies dessert recipe with Reese’s cups inside. These are a perfect addition to your Christmas cookie trays this year and simple to make! I can hardly believe how fast Christmas is approaching. Only one week from today. I, like everyone else, am just so heartbroken and sick over what happened in Connecticut and have been praying for all the families affected by this tragedy that God and his loving army of angels will begin to heal their hearts. Amidst all the hustle and bustle of holiday shopping, baking, and wrapping, there is a deep sadness for this horrible tragedy to have happened. I grieve for all those families who lost a loved one way too soon. Anything I can blog about or any recipe like this Peanut Butter Cup Cookies I can post now seems trivial after what’s happened. It seems strange to carry on as usual, but in case you want a break from the stream of sad news and do have baking you need to get done, I got you covered. This peanut cutter cup cookies recipe is a fail-proof cookie recipe to add to your Christmas cookie trays this year. 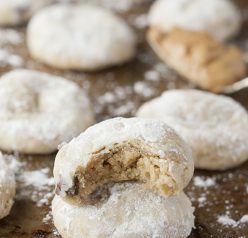 I have been wanting to make these cookies for years around the holidays and every year they get forgotten about or I just don’t find the time. This year I made them a priority and made them first thing! I got to break in my new kitchen for it’s first Christmas baking extravaganza. I have to say it was a much more pleasant experience this year having room to maneuver. The wide open space sure did make a huge difference and I was able to have a million things going on at once. In the old apartment kitchen I barely had room to make just one type of cookie, let alone 5 or 6 all at once. A similar cookie you will absolutely love is these Peanut Butter Fudge Puddles. Everyone goes crazy for them! NOTE: freeze the unwrapped peanut butter cups ahead of time. This makes it a heck of a lot easier to press the frozen candy into the hot Peanut Butter Cup Cookies without falling to pieces. It also makes it easier and faster to unwrap them. 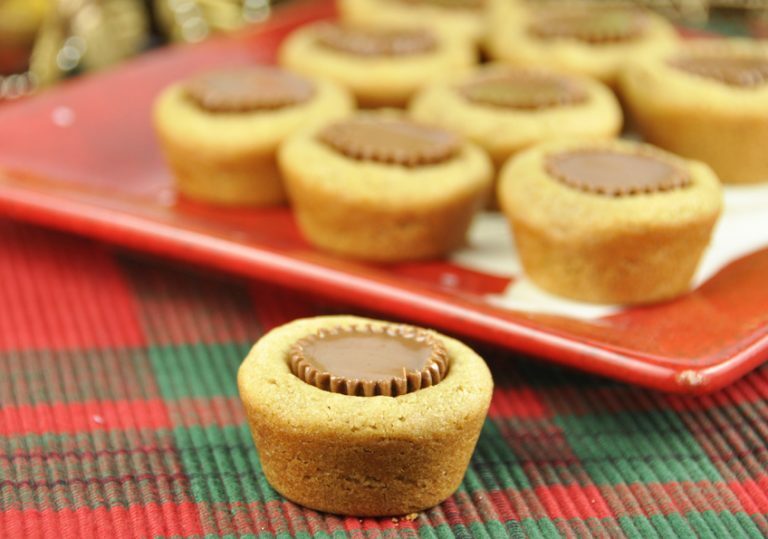 Peanut butter cookie cups dessert recipe with Reese's cups inside. These are a perfect addition to your Christmas cookie trays this year and simple to make! Mix together the flour, salt and baking soda; set aside. Cool and carefully remove from pan. I used a knife to pop them out easily. YUM! These look like perfection. 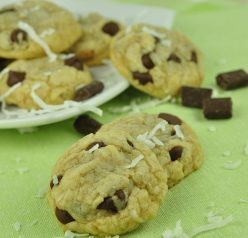 Love these classic and delicious cookies! I make these every year, but never thought to put the cups in the freezer before putting them into the cookie dough. Thx for the tip! I am making my later this afternoon. They are always a hit here in Minnestoa & California! What’s your suggestion on how to keep them fresh until the weekend family holiday party? The tragedy in CT will have me shook up for weeks. And I can’t even imagine what that community is feeling right now. My heart breaks. 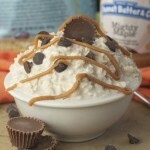 And easy recipe combining both peanut butter and chocolate… now that is what I want on my christmas list! They are adorable and so perfect looking, Ashley! YUM! Such a classic recipe that never ceases to please everyone! It has been such a sad week. I’ve barely even been able to turn on the TV or spend much time on social media because I just can’t process it all right now. Your cookies look delicious. Homemade food is so important to feed the soul. Great tip on freezing the pb cups!